Typical for the flight of the Great Spotted Woodpecker are the long 'waves'. 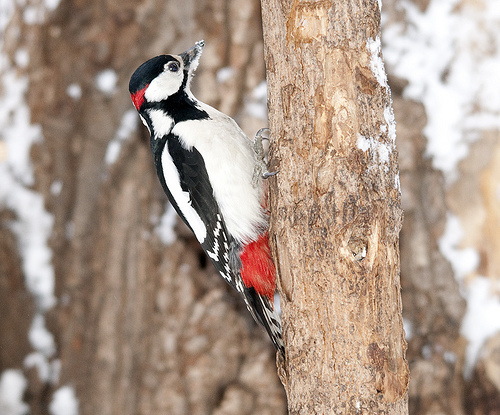 The Great Spotted Woodpecker is well aware when it is seen by people. From behind the trunk of a tree it occasionally shows its head to see if you are still there, but continues to hide itself. 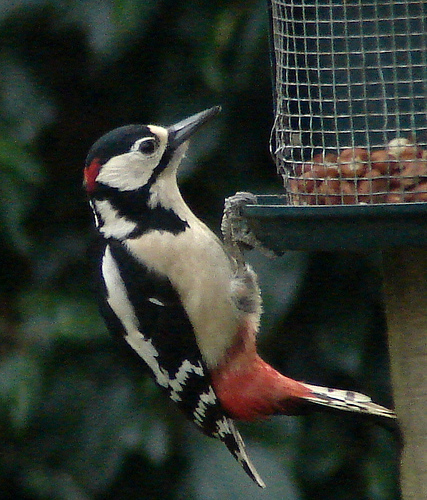 The Great Spotted Woodpecker lacks the Middle Spotted Woodpecker's red crown. Neither does it have the bright red vent. The Great Spotted Woodpecker lacks the Lesser Spotted Woodpecker' s red crown. The Great Spotted Woodpcker has a large white patch on the wings, the Lesser Spotted has white stripes.